Based on preliminary data, we forecast that total Canadian liquids production in November was up m/m by approximately 89 thousand b/d at 5.43 mb/d (+0.32 mb/d y/y). While upgraded and mined volumes rose m/m by 0.13 mb/d, primarily driven by a 46 thousand b/d increase at Suncor’s Base Plant, bitumen production dropped by 62 thousand b/d, primarily driven by decreases at Jackfish in Athabasca and Christina Lake, with smaller reductions at Hangingstone, Foster Creek, and Primrose/Wolf Lake. 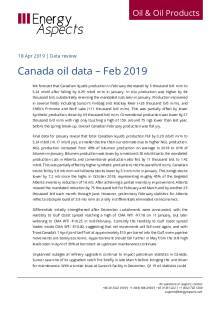 We believe producers had already begun to react to the lower outright price environment as indicated by several Q3 18 earnings calls and Q4 18 press releases, before the Alberta government announced a mandated reduction in West Canada production. Canadian conventional production was relatively unchanged in November, with 119 oil rigs operating just before the seasonal December rig reduction began. East Coast offshore output was down by 19 thousand b/d, on declines in Terra Nova and White Rose, but partially offset by higher Hibernia production. A significant low-pressure storm halted all East Coast Canada production for a portion of November, triggering much of the total reduction, but recovered quickly enough for the region to export at least one 0.6 mb shipment to the United Kingdom. In December, adverse weather conditions led to a leak at the Sea Rose Platform, which remains down as of 21 January. Lost production is estimated at approximately 20 thousand b/d. Final October data show total Canadian liquids production increased by 0.33 mb/d m/m to 5.34 mb/d (+0.56 mb/d y/y), versus our estimate of a m/m lift of 0.29 mb/d. Increases were concentrated in synthetic streams (+0.22 mb/d m/m). Conventional production rose by 53 thousand b/d as Hibernia continued to ramp up, while bitumen was roughly flat. Canadian oil demand rose by 25 thousand b/d y/y to 2.57 mb/d in November, led by gasoline (+64 thousand b/d) and distillate (+63 thousand b/d y/y), although demand is likely to be revised. Indeed, October oil demand was revised higher by 0.12 mb/d to now show 0.13 mb/d y/y growth. Canadian gasoline demand increased by 64 thousand b/d y/y to 0.88 mb/d in November, as unemployment fell by 0.2 ppts m/m to 5.6%, recording the lowest level since comparable data became available in 1976. This was driven by gains in full-time work, employment increased by 94,000 m/m, continuing to provide a tailwind to gasoline demand. The Consumer Price Index (CPI) increased by 1.7% y/y in November (reflecting the smallest y/y increase in CPI since January 2018) driven by a 1.3% y/y fall in energy prices. Gasoline prices fell by 5.4% y/y, logging the first y/y decrease since the inception of the gasoline index in June 2017.